In today’s busy world, we understand that having bank account access on the fly is vital. Whether you are traveling domestically, internationally, or just around the block, the ability to check on your balances, make transfers, or verify purchases is increasingly valuable. At Lincoln Maine FCU, we offer you a wide variety of ways to connect with your accounts. No matter where you are or what your preferences, we make it our priority to give you fast access to the information you need. Online: Access your accounts with a click! New users can register from their computer, laptop, or smart phone! Mobile: Looking for even easier account access from your mobile device? 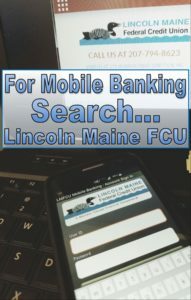 Download our app from the Google or Apple app store by searching for Lincoln Maine FCU!